In 1964, the Archdiocese of Los Angeles purchased land at the corner of Crown Valley Parkway and Nueva Vista. 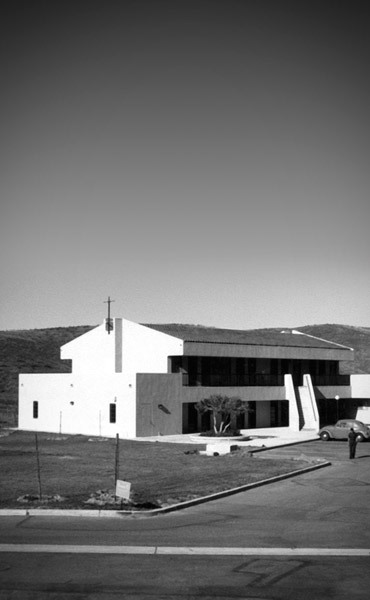 In 1969, Sunday Masses began at various places in the new community that was being built; these Masses were held in various school halls and office buildings. The priests who celebrated these Masses came from neighboring parishes, especially from St. Catherine of Siena in Laguna Beach. In June 1976, the Diocese of Orange was established and Bishop William R. Johnson was named its first Bishop. Then on July 13, 1980, Bishop Johnson officially established St. Timothy Parish and named it in honor of Cardinal Timothy Manning. The first Mass of the parish was celebrated that day at Crown Valley Elementary School; with Father Hal Fumo appointed as Administrator of the new parish. 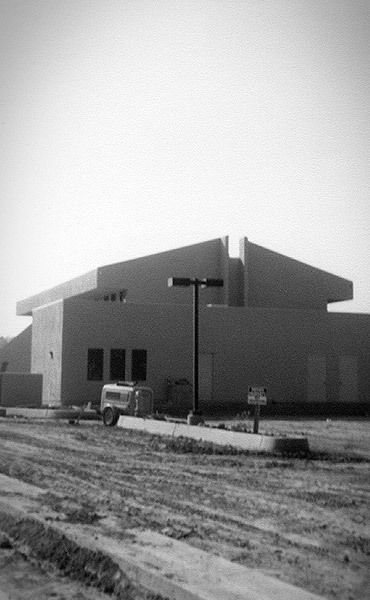 One February 22, 1981, Bishop Johnson officiated at the groundbreaking of St. Timothy’s own multi-purpose building (to be used for every sort of parish event!). The two story structure included a large hall downstairs (with a kitchen) and offices and small class rooms. The first Mass celebrated here on sight was on April 3, 1982. In 1984, Father Des Colleran was appointed as administrator of the parish and later that year, in November 1984, Father Bruce Lavery was appointed the first Pastor. The parish began flourishing in many ways; one way in particular was the growth of the pastoral staff as Sister Bernice Petronaitis, SSSF and Deacon Eddie Salgado (and his wife Sandy) joined with Fr. Lavery to lead the development of the many ministries and a very active parish life. Through the early 1990’s, many activities were in place in order to build the community of faith….and to build the community its appropriate places of Worship and gathering. Building commenced on the church in 1997 and the first Mass was celebrated in it on Palm Sunday, 1999. The Church was consecrated by Bishop Norman McFarland (retired Bishop of Orange) on May 8, 1999 who called the entire parish plant “a miracle”. This referred to the small amount of land that was to be St. Timothy’s, and the incredible creativity of the pastor and parishioners to build a parking structure (hence, adding square footage), an office building, a Church building, and all surrounding a beautiful plaza. 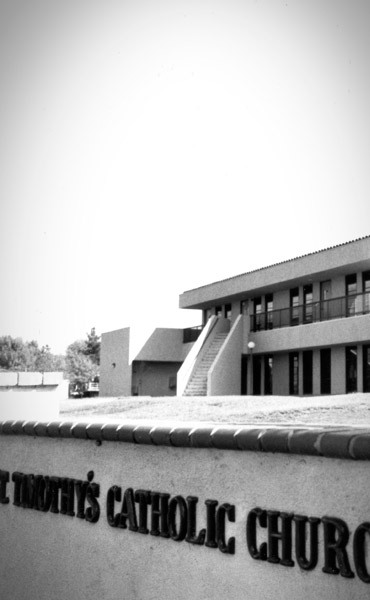 In 2004, the final phase of building was completed which included the Administration Building and the “Upper Room” (a large meeting room with a kitchen) on the second floor. A number of parochial vicars have served the parish throughout its history, and each has left his distinctive mark and memories. Fr. Dave Gruver, Fr. Fred Bailey, Fr. George Blais, Fr. Timothy Nguyen, and Fr. Paw Lwin have all added to the legacy of faith here. Father Don Kolda, SJ and Father Jim Fagan served here on Sundays for many years; Father Rosendo Silva lived in residence while serving as full time Chaplain at nearby Mission Hospital. Father Bernard Johnson, O. Praem., has served on weekends here for over 20 years and continues to be a blessed presence. Father Bruce Lavery retired as Pastor in September 2007 after serving 23 years. His unique, loving, pastoral, and personal touch is always to be remembered and cherished. At that time, Fr. Arthur Holquin was appointed as Administrator for 11 months; Fr. Mel Long graciously served during that time; and on August 29, 2008, Msgr. John Urell was named Pastor. Due to wonderful generosity, leadership, and careful stewardship, the debt on all parish buildings and was paid in full in May, 2009. The future brings continuing development of ministries, as well as maintenance and upkeep of the parish plant. This history is not complete at all without the many men, women, and young people who are the real life history of St. Timothy Parish. Through all the years of this community of faith, countless men, women and children have been touched and changed by the preaching of the Gospel, the celebration of the Sacraments, and the fellowship and service opportunities that abound. 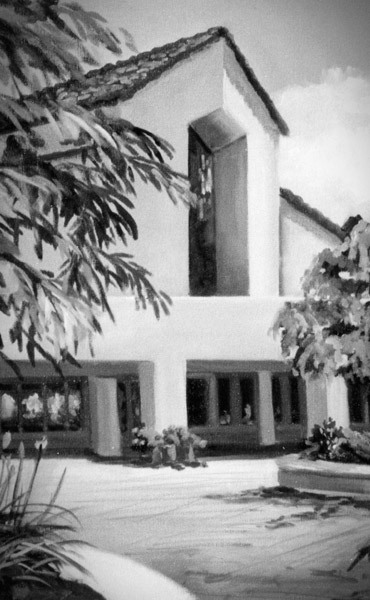 This is where the real history of St. Timothy Parish resides: in the hearts of the faithful people who make up the “friendly parish” and who continue to reach out in faith, hope, and love as a “welcoming parish” to the community of Laguna Niguel and the larger community of south Orange County.